Last week I was moaning to Brent...it just isn't getting easier. All these hills, 800 repeats...I felt like I was on the BYU track team and dying to keep up. I wasn't feeling any improvement. The big test came on Saturday. 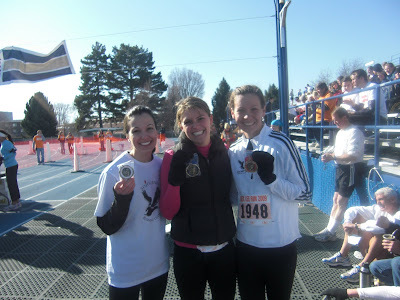 The Rex E Lee 10K Run at BYU. My first 10K since July. I actually felt great and came in at 42:06...my fastest time by 6 minutes! Apparently the speed work-outs and hill repeats, and tempo runs are doing something for me. The time put me at a 6:48 minute mile. In High School I thought a 9 minute mile was the fastest I would ever run. I ended up placing first in my age group (hence I look the coolest in the picture up there because I have a blue ribbon, but I wasn't nearly the coolest because Marie was 2nd overall 38 minutes and Melody was third 39 minutes!) and sixth overall in the women. Way to go! I'm so impressed!! I'm glad you saw the awesome and rewarding results of our dreaded speed workouts. We're going to rock the Ogden Marathon!